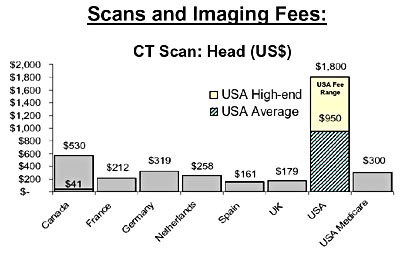 As you can see from the chart, a head CT scan costs about $950 in the U.S. vs. an average of $276 in six other countries. That’s a difference of about 3.5x. Which is still a very big difference. As I’ve mentioned before, here in the U.S. we pay higher fees to our doctors, we pay higher prices for drugs, we pay higher prices for diagnostic tests, and we pay higher administrative costs to our insurance companies. If we want to reduce healthcare costs, we have to do something about all that, but both Obama and the Democratic leadership in Congress have (quite accurately) decided that doing so right now would earn the undying wrath of doctors, Big Pharma, insurance companies, hospitals, and device manufacturers, and together they could easily kill any chance of passing healthcare reform at all. So instead we’ll pass reform now without addressing prices and then hope that maybe we can do something about it later. And maybe we can. But don’t bet on it: interest groups fight like crazed weasels to keep what they have, and they usually win. We might be able to freeze cost increases a bit if we put some serious muscle into it, but that’s probably about all we can reasonably hope for. Or maybe technology will save us. You never know. More charts here. I’m sure everyone will have their own favorite. 1Apparently it was a mistranscription. Halvorson actually said $1,500, not $15,000. Ezra has since corrected the original post.